"I wanted to thank you and Mary for your work as Lincoln and Mary at our 2008 NCHE National Conference. I heard many participants say what a great job that you did during your presentation." After extensive study on the life of Abraham Lincoln, I can appear before my audience and present Lincoln’s amazing story in the first person. My mission is to portray Lincoln as he would have addressed you. I’ll tailor each performance to the audience using stories, anecdotes, speeches and other historically accurate information. Most programs are 40 minutes to 1 hour; if time permits at the end, I will step out of character and entertain questions from the audience about Lincoln. I like to end with a good story, joke or a few wise quotes from Abraham Lincoln. I. Program Overview: I portray Lincoln’s life by beginning with a true story he said was told to him, over and over, by his father, Thomas Lincoln, when he was a little boy: Daniel Boone had persuaded the Grandfather to move to Kentucky in 1782. As he was working on his farm with his three sons, he was brutally shot by an Indian. It looked as though 6 year old Thomas was going to be taken away by the Indian, but his brother Mordecai, bravely shot the Indian and saved his brother Thomas’s life. I then proceed to tell of my birth, as I was told, of being born in a one room, dirt floor log cabin. I tell of stories and events in my Kentucky years, my educational ambitions of reading and writing, moving to and growing up in Indiana, my self taught Lawyer years in Illinois and to my historic finish of saving our Democracy and freeing the slaves. 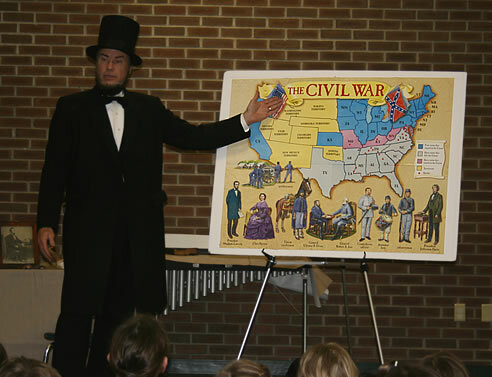 For fourth grade and older, I like to use a large colorful map of the 34 states as they were in 1860. It easily identifies the Union States and Confederate States and truly helps them understand the great controversy leading to the Civil War. See map. For third grade and younger, I tell about childhood stories of how I got the name Honest Abe and other stories they can relate to. For sixth grade and older, I usually recite the Gettysburg address and sometimes recite the important lines of the first and second Inaugural’s. For adult audiences, I will use stories and jokes that are age appropriate. II. Variations/Additions: The following are other programs that can be part of the presentation above, depending on the time given and the audience; or can be separate programs, used alone or in combination, depending on your needs. All of the following will have various stories, anecdotes, parts of speeches etc… that will pertain to the specific program being given. Words He Lived By: (see the bookmark at the left containing the 12 word acronym: ABRAHAMS LIFE) This bookmark is given to everyone in the audience. Each one of these words was the fiber of Abraham Lincoln. I will present what he said and did pertaining to these words. This presentation ends with the Gettysburg Address and takes about 25 minutes. This is appropriate for all audiences. From Slavery to Emancipation: Program of the history of slavery in America leading up to the crisis in the 1850’s and Abraham Lincoln being a mere instrument of God to emancipate the slaves. The Emancipation Proclamation is given. The length of this program is 20 minutes. Thankful Nation: How and why Abraham Lincoln declared Thanksgiving a national holiday. This program gives the history of Thanksgiving dating back to our first settlers in 1621. It leads up to Sarah Hale’s continual quest with previous presidents to declare it a national holiday in hopes of uniting the North and South. This is 18 minutes in length. The Kansas Nebraska Act that propelled Abraham Lincoln back into the Political scene. This was a historic moment in 1854 American History that set Lincoln on a new path. It superseded the all important Missouri Compromise of 1820 that said slavery could not expand in the new territories. I recite Lincolns famous Peoria, IL. Address which set the stage for the famous Lincoln Douglas debates. This program is 15 minutes. The War Years: This detailed presentation is for the real history buff. It begins with one of Lincolns debates with Stephen A. Douglass in 1858 and leads into my nomination as the first Republican President of America. It uses the 34 state map (shown on this site) with emphasis on the succeeded states forming the Confederacy and setting the stage for war. I portray many details of each of the four years of the war reciting many parts of different speeches throughout the war and of course stories and a joke or two. This is a very historical portrayal and is my personal favorite. It ends with the Malice toward none and charity for all messages as Abraham Lincoln prepares the country for reconstruction. This program is 45 minutes. Wartime Leadership: The true story of How Lincoln failed to select the right Generals and his sincere apologies for that. It begins with me telling the Chief of our Army, General Winfield Scott to offer the army of the Potomac to General Robert E. Lee and why Lee turned it down and went south. I portray Lincolns frustration with all of the Generals (except Grant), especially General George McClellan, “The man with the slows”. I then offer the General and Chief of all armies to Grant in 1864 knowing I have found my man. I now can run things in the White House and not the war department. I conclude with how Grant ends the war with the siege at Petersburg and the infamous surrender of General Lee at Appomattox. This is 35 minutes in length. Lincoln on Leadership: I give an overview of Abraham Lincoln from a historical aspect and the publics' reflection of him. I then give a short portrayal of Lincolns Kentucky log cabin beginnings all the way to the White House and leading our country through it's most difficult four year period ever, the Civil War. I proceed with portraying (16) of Lincolns extraordinary leadership characteristics. This program is 45 to 50 minutes but can be reduced if needed. Lincoln’s Christian Life: I give the life of Abraham as a Christian beginning with his early foundation of the Bible but also later as a young man being a skeptic of the Christian faith. However, he was always seeking the truth and I give examples of his trials that bring him closer and closer to the saving grace of Christ. At the end of the Civil War he was given a Bible by some colored men and said to them “In regards to this great book, I say it is the greatest gift GOD ever gave to man”. He said just before he died on Good Friday April 14, 1865 that he wanted to travel to Jerusalem and walk where our savior walked. This program is 20 minutes in length. Kentucky's Strategic Role in the Civil War: I announce the good news that the war is over and we must judge not that we not be judged as we move into reconstruction. I also give an account of many of my Kentucky connections who made my presidency possible. This program is 25 minutes. Custom Presentation: Your program that specifies what you might want performed for your event. You give me the details and time period; and I will research and portray it. The Story of Our Lives in Contrast: First person presentation of our lives from childhood, how we met, our Springfield IL years and our years in the White House. We end on April 14, 1865 as we depart for Fords Theatre. This is for all audiences. The White House Years: First person presentation where we share with our audience what it was like to be the president and first lady during the Civil War. This presentation is for people who have a knowledge of this time in history. This will keep you on the edge of your seats. We like to end with an opportunity for the audience to ask questions of both of us. Many want to know what became of Mary after Lincolns death and a few details of the manhunt of John Wilkes Booth. If time allows I will give the 13 parallels between Lincoln and Kennedy’s assassination.